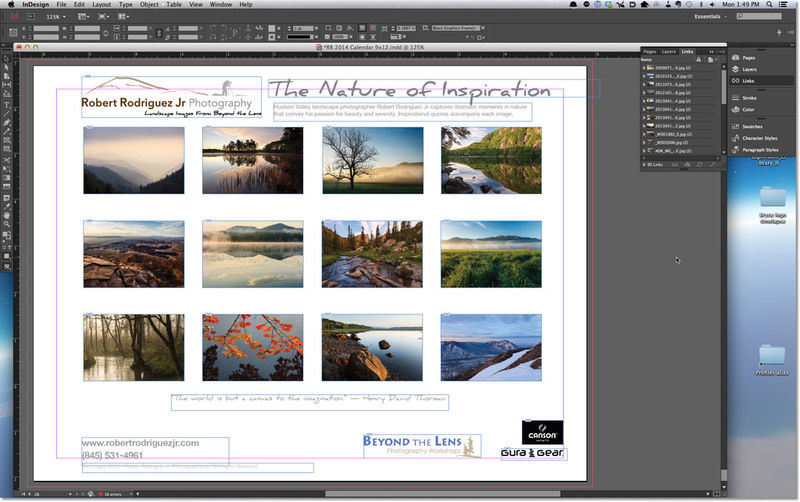 With the launch of the 2014 “Nature of Inspiration” Wall Calendar, I wanted to share the process of creating and publishing the calendar for all those who are thinking of doing the same, or are just curious. 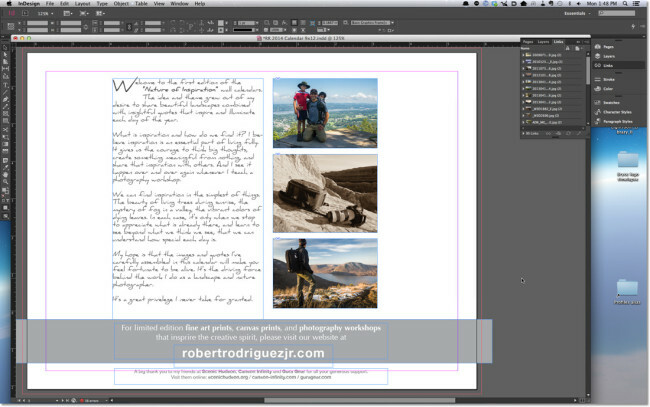 I’ll cover the design and layout, as well as the financial and marketing aspects of self-publishing a photo calendar. 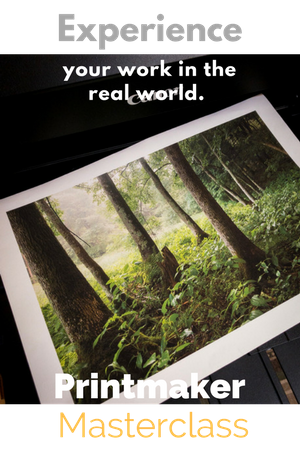 I use a commercial printer, so this is not about doing it at home on a photo printer. I tried that already, and it just doesn’t make sense in terms of costs, labor, and headaches, especially if you print more than just a few for family and friends. Collecting and organizing quotes in Evernote. It all starts about a year in advance when I start collecting quotes that I think would work well over the course of 12 months. 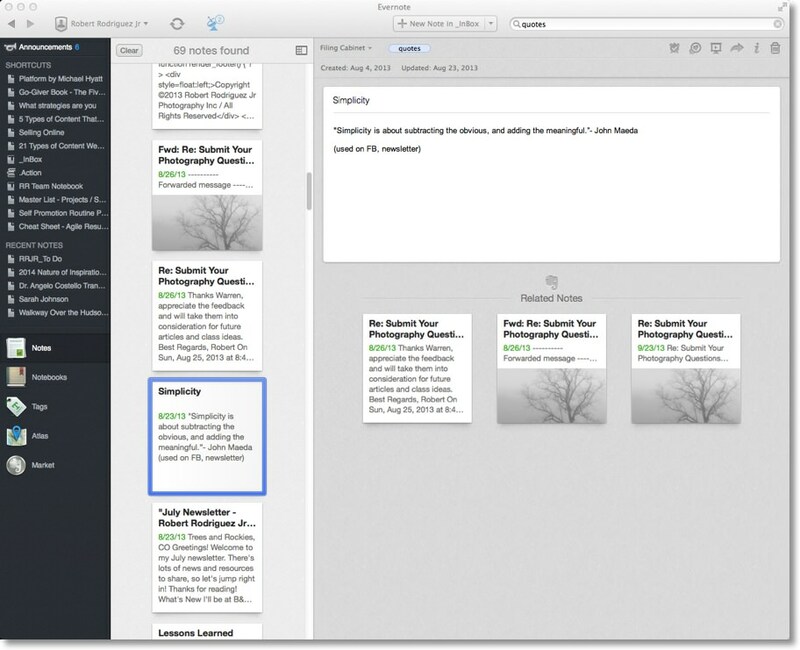 I save them all into Evernote from wherever I find them – books, online, talks, videos, etc. Once I’ve settled on 15 or so, I start to select images that I think complement the quotes. Some are obvious (seasons, subject matter) while others are not, and that’s where I get some help from my wife to make final decisions I get stuck on. Often the images elicit certain emotions that remind me of the quotes, and so are more personal than others. Like all photography, I hope that viewers will also have a similar response, so I go with my instincts as much as possible for final selections. The cover is really challenging because it creates the first impression, and also for me it has to somehow encapsulate the entire feel of the calendar. It also has to work well with the type and that needs to go on the cover. I chose this years cover image based on my memory of the moment- lets just say I was pretty inspired when I made the photograph. It’s in the Dream Lake area of Rocky Mountain National Park, and I made it on my trip there this summer with my family. 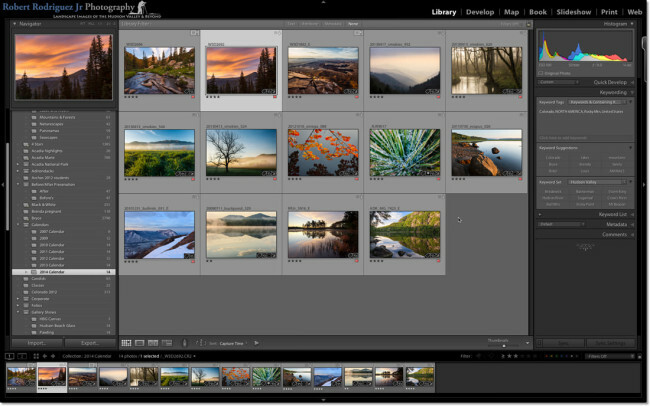 Final selections in Lightroom 5 saved to a collection. I keep a separate collection for each year – makes it easy to see what I’ve used in the past. Once I have all the selections, I let them sit for a while (a few weeks) then revisit them and make changes if necessary. Once I’m committed, then it’s on to the design and layout. Gather images in a collection in Lightroom. Export from Lightroom at the desired size and resolution – because the images will fit horizontally on each page, I export them at 12.25“ wide @300 ppi. (The extra 1/4” is for the required bleed margin on each side of the page.) The height comes in at about 8″ so I use the extra white space at the bottom for the title and quotes. I would have to crop to fill the page completely, and that often changes the composition substantially. File format = tiff / Color Space = ProPhotoRGB / Bit Depth = 16bit / Sharpening = Glass paper, Standard. 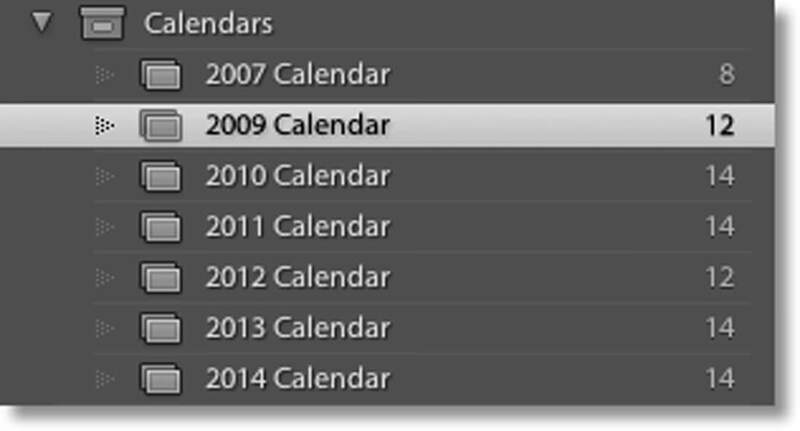 My export settings from Lightroom 5 for the calendar. I then open each image in Photoshop and select “Convert to Profile” under the Edit menu, and select “Working CMYK” under Destination Space. 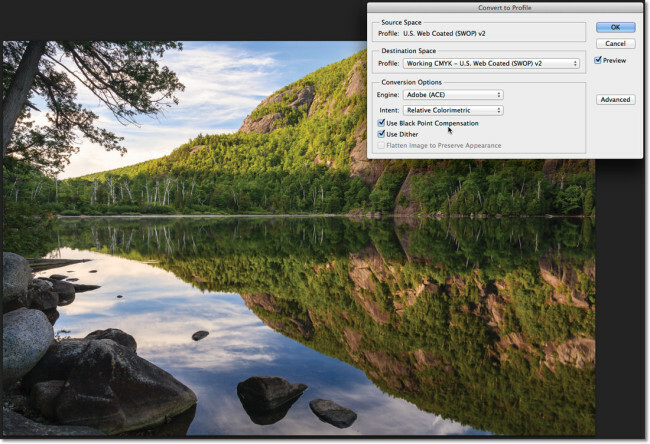 This gives you better results and more options than just using the Image Mode menu to convert to CMYK. Once converted, if there are any substantial differences in color or contrast, I adjust them here using an adjustment layer. Usually it involves out of gamut colors like green or yellow that sometimes need an extra boost to look vivid again. The images are now ready to be placed into the layout on the main calendar pages as well as the thumbnails on the back cover. When the design is done and proof-read, I export a print ready PDF. I use CopyCraft for printing, and they have an PDF Export preset that makes sure all the settings are to their specifications. This includes no compression of the images to make sure they look their best in the final calendar. My final PDF file was 497MB in size. I then export a web version of the entire calendar as a PDF, as well as each page of the calendar as jpeg for sharing online. These are exported in RGB in the sRGB color space. 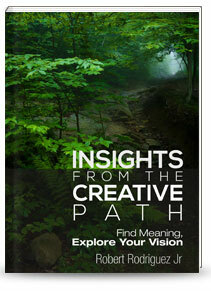 I use Photoshop to create the various mockups for promotion. I upload the final PDF to CopyCraft, then wait for a proof from them to make sure everything looks ok and the file doesn’t have any errors. Once I approve, it goes to press! 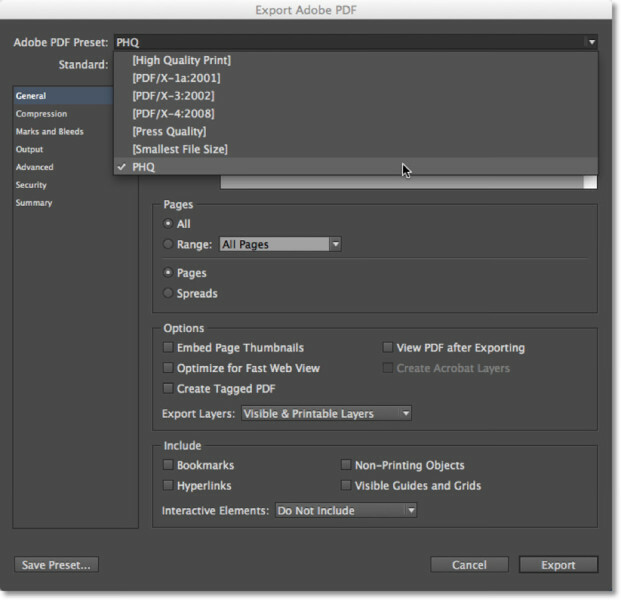 Exporting from InDesign with the CopyCraft Preset – makes it easy and convenient. It goes without saying that without some kind of platform or distribution, it will be difficult to sell a calendar. So I rely on social media, past customers, my email list, referrals, and local outlets to generate sales. Forget the big box stores like Barnes and Noble or similar – they rarely carry products from independent distributors. Amazon.com is another option, but their cut is steep and you must have an ISBN number. I primarily sell the calendar here on the website, and make sure to have a basic system in place to ship orders out as soon as they come in. My wife handles that, and it includes mailing labels, envelopes, and postage. I also sell the calendars through local stores and galleries in the area, and I’m always looking for new avenues that may want to carry it. Some other ways I have sold the calendar in the past is to find other business’ that have a similar target market, and have them give it to their customers as gifts. All of these are outlets that I have developed through the years, so it’s important to have a long term marketing strategy in place and stay active on it not only when you have a new product, but throughout the entire year. For many years I sold the calendar at art fairs, and now many of those customers buy directly online. I also set aside some calendars that I give as complementary gifts to a range of people and organizations. They have all been instrumental in my success as a photographer, and so I like to make sure they know I am grateful. I also send the calendar to those I want to stay “in front” of – galleries, interior decorators, corporate offices I have contacts in, etc. it makes a great marketing piece that remains active for an entire year – very effective. I hope this information is useful – any questions or feedback, I’d love to hear from you! Thanks for reading and of course, you can get your own copy here! Thanks, Robert, this is very helpful indeed! Am looking forward to your 2014 calendar. Thanks Nancy for the feedback – glad the info was useful and any other questions, let me know! Thank you for sharing your technical expertise and experience. Very interesting. Best wishes. Hi Caroline – thanks for the feedback and for reading – glad it was helpful! I would understand if you didn’t want to answer this question ..but could you divulge the hard cost for printing?? Thinking of a gift calendar for our business clients! Hi Ron – thanks for the feedback, and no problem at all. 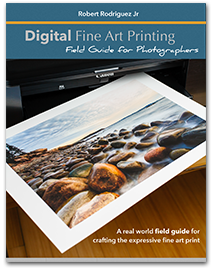 For 500 calendars, printing costs are about $4/ calendar. Last year I sold about 300 and used the remaining 200 for marketing and gifts. Is that $4.00 per calendar with most commercial printers? Or do you use one in your area? I am in the Portland, ME area. Great post. Having done two calendars for the past two years, I know how much goes into the work. It is not just selecting the images, but proofing, making sure the dates and words are correct, in the correct order, and hoping that the numerous times of proofing it didn’t miss anything. It is a great marketing tool, but also a tough market in which to compete. 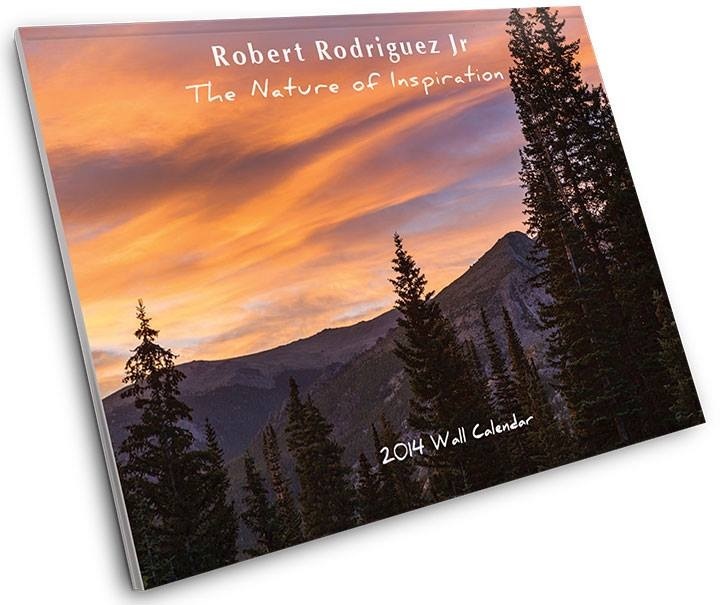 Your images and words go together so well, and that is what makes it a great calendar, purchase, gift and thank you. I am only doing the CD calendar this year, and I am sending the proofs to the printer now! The Beauty of New York State. I will send you one. Best to all, and have a great workshop in Acadia! 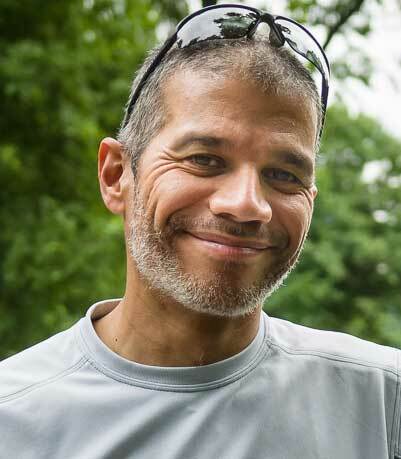 Awesome Bill, thanks for the feedback and for sharing your calendar info – always enjoy yours too! Now lets hope the silly government shutdown gets worked out, otherwise Acadia will be closed…crazy! I appreciate all the work you put into your daily shooting and to show and instruct me how to better my work is commendable. Robert, it’s amazing the amount of tips you give to us all as well as find the time to answer questions one on one. 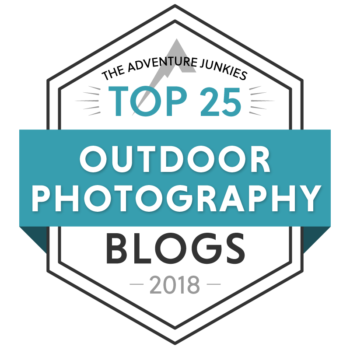 If more photographers were like you…but we have people who are too caught up in the world of ‘I won’t give away my secrets’. On another note, when it comes to anything that has to do with designs I usually work with 3 programs, Illustrator, photoshop and indesign. I end up exporting from either illustrator or indesign. The work flow is relatively easy from program to program. One gripe is with Adobe’s new system overhaul (you may have mentioned it before, not sure) when it comes to a subscription based system. We all now have to pay on a monthly basis so I believe a lot of us are deciding to use the legacy version. I use CS 5 because of the lack of option (Chromatic Aberration) in CS6. 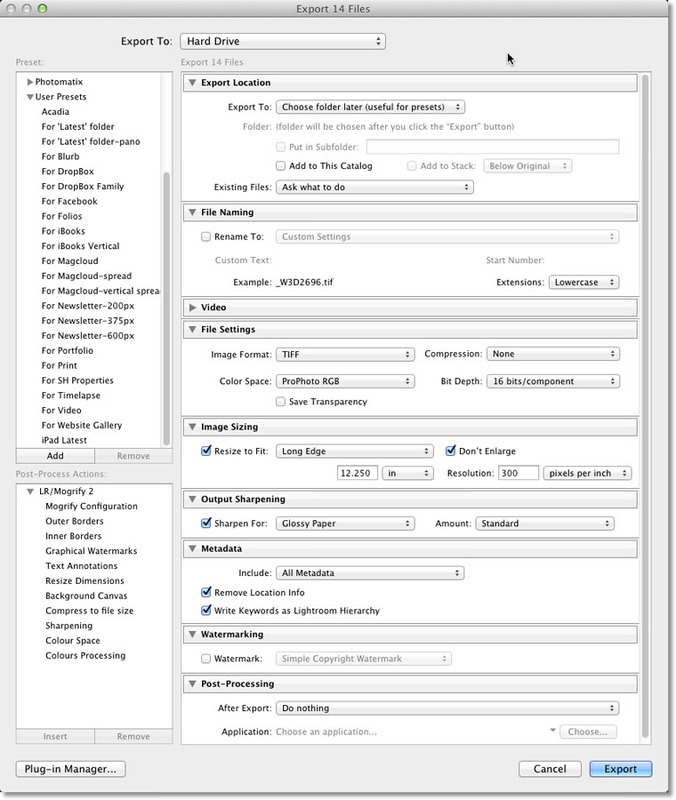 Adobe claimed they have a built in program that ‘automatically’ gets rid of it…yeah right!!! Anyway, you may have covered this topic before. I know this is kind of an older post. My wife and I are looking at the possibility of creating a calendar for our current customers. Would be made for 2016. I’m wondering where you get your calendars printed? Are you using a local vendor? Or do they have a website we could check out? Robert says he gets his calendars printed at CopyCraft in the post. I did some research and found that CopyCraft has a new name Slate Group. I was curious about where to go as well. I love your website and beautiful photos and quotes. I am a total novice and have been thinking about doing a sports calendar for my customers and friends. Not thinking about profit as the main objective, I looked at the Vista Print website. Any thoughts? Thanks. Thanks for the article. I am wondering if you know where I can get some counter top display stands which will display one of my calendars while holding maybe 10 more in stock? I want to provide them to the stores which will be selling my calendars. Thanks! How many Calendars have you been selling each year? I have a question. I have many photos of nature, small animals, & flowers that I took during my college years in the 1980’s. Most of those images are on “Negatives.” And a few are on those little square slides. How do I transfer the images on the “Negatives” and “Slides” onto a digital format, so they can be uploaded onto the computer? I really like your ideas. I wanted to do one for just anchorage Alaska, all about buses. I’ve heard from several people that they would buy a local calendar about buses if there was one somewhere. I thought, have pics of local school buses from Anchorage School District, local city transit buses from the Municipality of Anchorage, local Motorcoach Tour buses, limousine party buses, etc… We have a couple of smaller calendar stores in town and etc…. Should I approach the local calendar store and then tell everyone about it? Just the information I was looking for thank you so much Robert for, sharing your knowledge with us. I now have to sit down and learn to create my calendar. Really nice post. Thanks a lot. Hi! Thanks for the helpful information. My client is a developmentally disabled photographer trying to create his own business with his own customized calendars . Can you plz recommend me or give me the name of the place where you received The calendars for four dollars each? Thanks ! I appreciate it ! Robert. Thank you for the detailed process and information. I am looking into creating calendars as well. 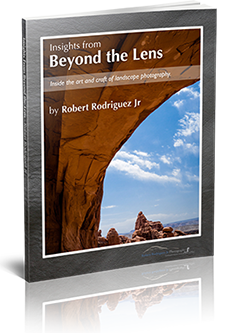 I am not a seasoned photographer but my daughter is very good so I hope to capture her expertise and put out my first version in 2018. I work full time in the Power Utility Industry so for a few weeks a year I plan to gather pictures for my publication. lm not sure, maybe I missed it but can you tell me how long it takes you and your wife to create a calendar from concept to print so I don’t short change myself in the logistics and process? I recently became inspired to create a calendar. Your site was my first stop. Thank you for sharing! I hope you all the best! I really liked your idea. 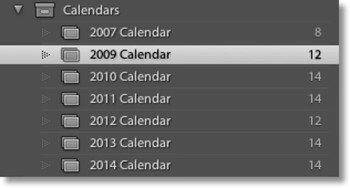 I recently created a calendar for my family in this program: http://photo-calendar-software.com/. I advise you to look, there you can very simply make a beautiful calendar. Very nice suggestions…helpful! Thank you.